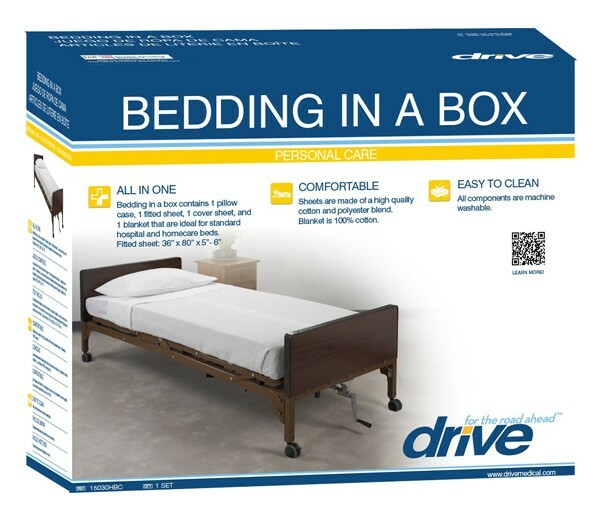 The Bedding in a Box set from Drive Medical is perfect for use with most standard manual, semi-electric and full electric beds. The set includes a fitted bottom sheet (36” x 80” x 5”- 6”), a top sheet and a pillowcase - all constructed from a cotton/polyester blend, along with a 100% cotton thermal blanket. All components are comfortable and machine washable. Contains: 1 pillow case, 1 fitted sheet, 1 cover sheet, and 1 blanket (100% cotton) that are ideal for standard hospital and homecare beds. The sheets are made of a comfortable high quality cotton-polyester blend. Fitted sheet size: 36" x 80" x 5"-6"